Well, for two months in a row we have been reminded that you can do all the planning in the world, but you can’t control the weather. After the February ‘Near death experience’ endured on the path to Canberra, the 18th of March would ensure that if your car had not dried out by now, it would certainly be toasted by the end of the day. Members and guests gathered at the MacDonald’s Heathcote meeting point at the designated time to enjoy a coffee and catch up. You could be forgiven for thinking that the weather forecasters may have got it wrong as there was still a slight crispness about in the air. It seems that this is a popular meeting point for all heading south and the normal parking problems were encountered. It was quickly 10.15 and time for a briefing to hand out the running sheet which included some last-minute changes and a questionnaire to add a little twist to the day. The forecast of 40-degree temperatures and hot winds meant a total fire ban and consequently the Woronora Dam was closed for the day. Plan B would be needed. Getting out of the MacDonald’s carpark would prove harder than getting in but eventually we were all underway in an unorderly fashion. Like a Good Shepherd, President Craig got the convoy in order by pulling over once we reached the more secluded Old Princes Highway. What a sight it was, a great formation of 240’s, 260’s, 280’s, 350’s, 370’s, a 260C, a modern and even a welcome guest in a VW Carmen Ghia. The Red 260c lead the convoy down Lawrence Hargrave drive taking in some spectacular views of the ocean road on our way to the Scarborough Hotel. Not in the original plan but the diversion apart from the parking chaos was welcomed and celebrated with a drink overlooking the mighty Pacific Ocean. 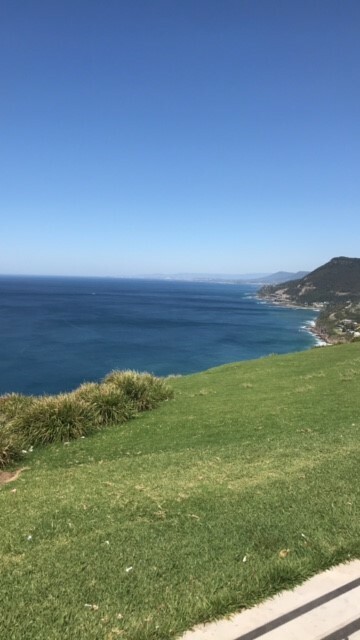 The next stop was to head back up the hill to the Stanwell Tops Lookout, about a 15-minute run. Again, it was a little difficult to park but luckily, we had planned for this and a few chose the overflow parking a little walk up the road. 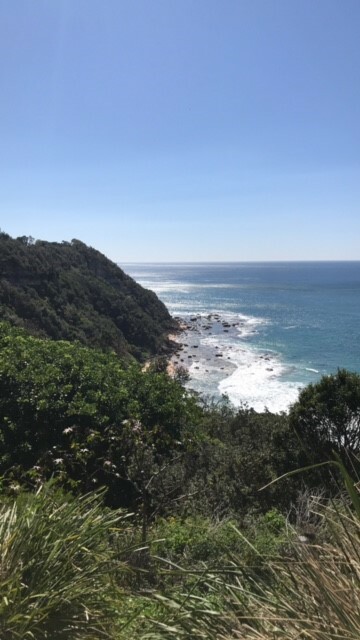 Apart from taking in the beautiful views it was also time for the questionnaire to come out as members were keen to share in the massive prizes up for grabs. Rather like ants running from one end of the lookout to the other to get the right answers. It was time again to move on for our drive through the winding roads of the National Park. We were not the only ones enjoying the drive with various other groups passing through including the V8 Holden ute club, Lexus and various top down convertibles. 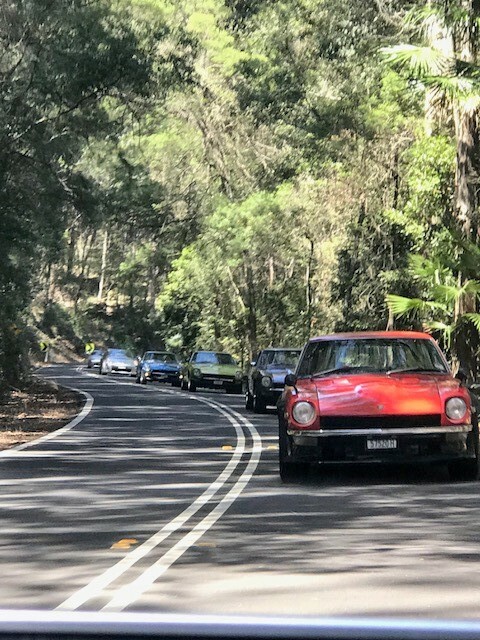 Had we been a little earlier we would have also passed the Sydney Datsun Club on their run to the Robertson in the Southern highlands, which is our destination for the April Run. As expected the little Village of Bundeena with its busy main street was always going to be a quick stop due to parking issues. Have I mentioned any parking issues so far? 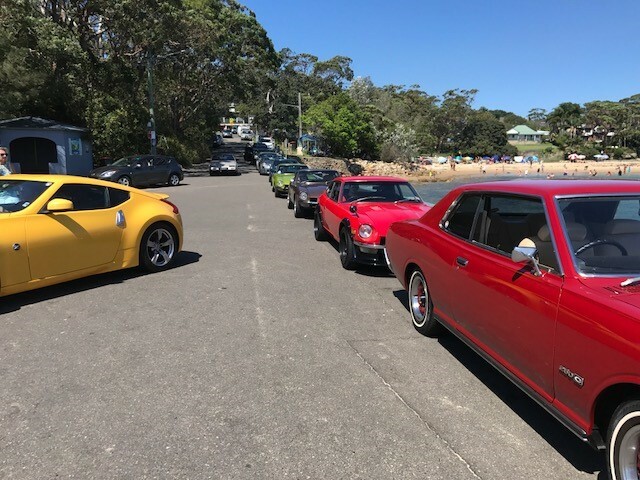 We chose to live dangerously by lining up along the wharf road which featured the beautiful Bundeena beach as a backdrop to display the cars. With no Parking Rangers in sight we had just enough time to have a quick look around, take a few pics and collect the last few answers required to be in the running for the Sheet Station prize on offer! A little more traffic chaos getting off the wharf but within a few minutes we were in the air-conditioned comfort of the Bundeena Bowlo and all had been forgotten. The Bowlo was an unexpected surprise with cold drinks and good food. We were accommodated nicely with good seating and quick service. Congratulations to John and Kay who took out first prize with a perfect 10 out of 10, with Craig and Maddy taking out 2nd place. In summary attendance was good with 26 members and guests and 13 cars. To all participants especially the ‘un air conditioned’ owners thank you for making the effort to get out and about in the heatwave conditions. The temperatures encountered on the day would scare many old car owners away but not the mighty Z car club! Looking forward to seeing everyone at the April event in the southern Highlands where I’m sure you will have no parking problems and much cooler temperatures.